We've reached the end of our study in Philippians 4. Paul has charged every Christian to rejoice in the Lord always, allowing His love and gentleness to be evidently seen through us. He has called us to relax in the Savior... to not be anxious or worry about our future, but rather spend our days focusing on the unique and kingdom-building blessings of our eternal hope in the Lord. He shows us why we must always glorify God's presence and acknowledge His truth, nobility, righteousness, purity, loveliness, admiralty, excellence, and praiseworthiness. But now, the most important lesson of all is about to be laid out. Here, the apostle will teach us that the consideration of these evidences, and the worship of our Savior, will indeed guarantee us peace... will certainly give us strength... and will definitively meet all our needs. 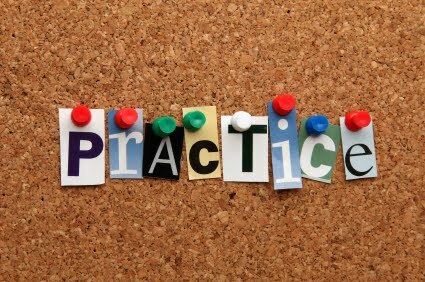 But here's the thing... we must put our faith into practice. We must not only think about such things, but we must live them. We must believe that this is our new Way of life -- the new path that Jesus has given us to follow. There is no more room for excusing sin. There is not a place where grumbling is acceptable. No, we are to always... ALWAYS... rejoice!!!! We are to always be gentle as we showcase God's holy house within us and be pleased to meditate on and share His majesty with anyone we meet. We are to live as ambassadors, representing His throne... representing a new economy... a new people. Ladies, we are to "take captive every thought and make it obedient to Christ." (2 Corinthians 10:5) We are to always rejoice in the Lord and love love love love LOVE because His Way guarantees us a full and peaceful LIFE! Let us take to heart Paul's instruction and put into practice a life that honors Jesus' Name. After all, practice makes perfect, right? Yes, today is the day to be an active participant in God's divine nature! Jesus is our beloved, and we are His! So, let's allow the Master to build our faith strong as we obediently and deliberately put into practice His goodness, knowledge, self-control, perseverance, godliness, affection, and love. Let us rejoice and think about ALL HE IS while allowing His gentle, transforming grace to change all we once were! For, ladies... to live is Christ! There can be nothing else. There can be no one else. Come... let us unite and fully know His complete and satisfying perfection, shall we? Come... let us put into practice our adoration and complete devotion only to Jesus, the King of kings!!! !